I really didn’t have to go through this much trouble to get my sister to use my deodorant. But if she’d been hesitant, I totally would have. Go back a strip (by clicking here) if you want to know how this all began. the answer is: jeff shiest = dog poop! mom always liked you best…..
ha! thanks for the info, anno nym. i just may have to use it in an upcoming strip! Now I get what you guys were talking about at the Spoon!! Muy funny!!! Talking about at the… spoon? Jeff, you lead a very unique life. if you saw the spoon mary’s referring to tomix, i’ve no doubt you would retract that statement. So realistic, I can picture you and Michael haven’t that conversation. But, shame on you for tricking your sister! she likes being tricked. doesn’t everyone? Well you could use “hundescheiße” or just “hundekacke” (= dog crap). Köln is only the name of the city of cologne. The use of Cologne for perfume came from Kölnisch Wasser (a certain type of cologne), the french name au de cologne and then just cologne. I think that “hundescheiße -au de cologne pour homme- “sounds hilarious but that could just be beeing weird. thanks for another option, henning! you readers are the best. screw google, i’m relying on y’all for answers from now on. “hundekacke” sounds pretty funny, but “hundescheiße” does, too. one of those is going on jefbot’s label for the Reich Gärt, for sure. Funny! Seems very logical to me, I don’t know what the Cornfather could take umbrage with. 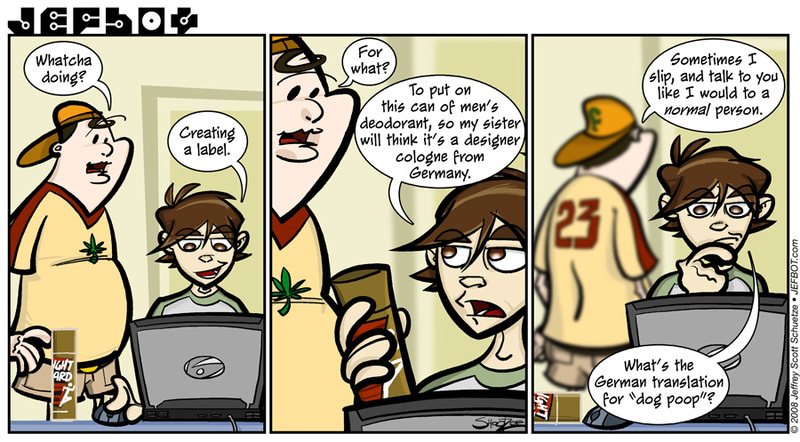 I just realized how totally awesome the background to this site is and forgot what my comment on this comic was. Good job. thanks for noticing, j. thought it’d be fun to dress up the site header a bit for halloween. I don’t think there is anything wrong with making up a fake brand of German cologne for some so obviously irrational as your sister. Excellent job! I love the exasperation of the Cornfather, in the last panel. IRL, he’s just as crazy as the rest of us. Well, sometimes we take it to the next level…but, he finds his way.